Deluxe canvas bag featuring "Alberti's Window" (from Geome One) printed on front. Main closure zippered and additional front compartment. Extra compartments inside. Also comes with adjustable shoulder strap. An artist of remarkable inventiveness and vision, Adi Da Samraj created art for over forty years. 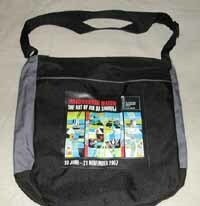 This tote bag commemorates "Transcendental Realism, The Art of Adi Da Samraj" exhibit, held at the world's largest and most prestigious art event, Venice Biennale (2007). That collateral exhibition marked the first showing of Adi Da's work to the public at large. Since His emergence onto the international art scene in 2007, Adi Da’s art has consistently drawn broad critical acclaim.